The 2012 Plaque is UP! 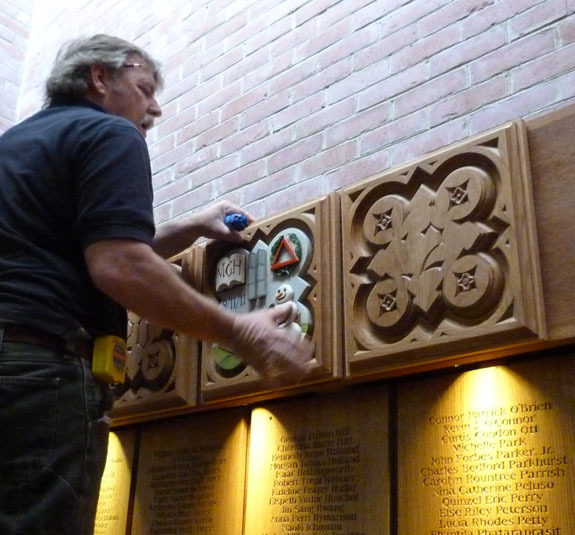 Today, with much less fanfare but no less enthusiasm, the framed 2012 plaque was placed in its final spot in the Middle dining hall of Upper (Coit). The Form of 2012 had its representative today in the person of Amelia D., who is working as the summer intern at Ohrstrom Library. 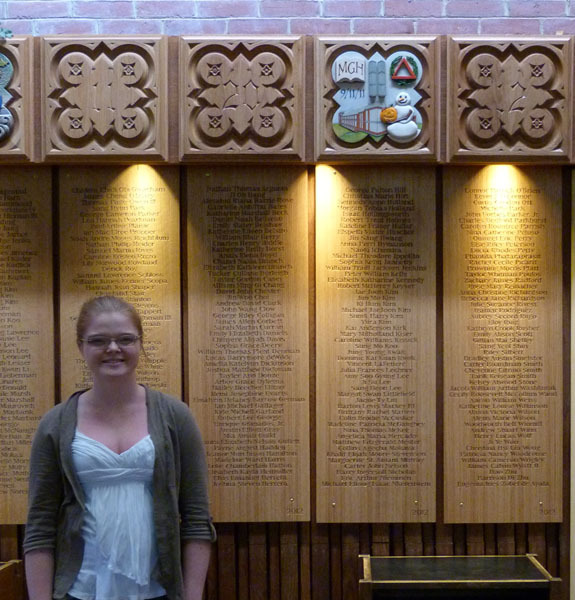 Thanks to Amelia, Scott, and all the representatives from the Form of 2012 for turning out to see the 2012 Form plaque! 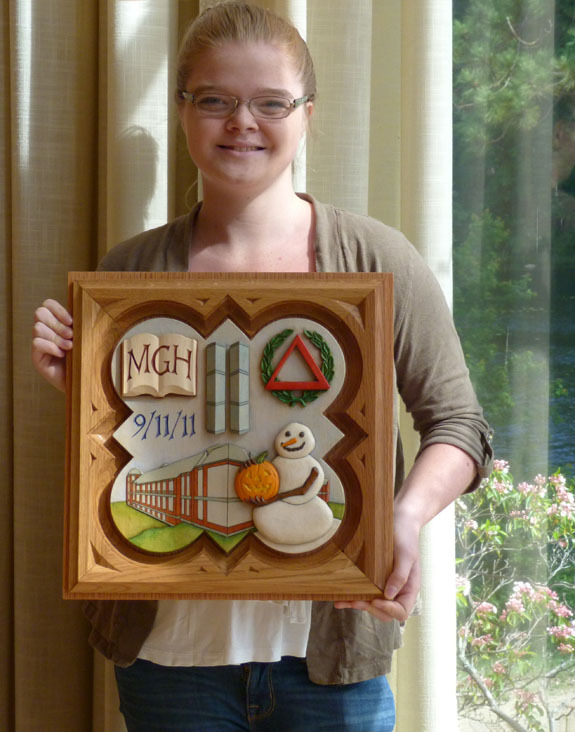 Here is a photograph of the completed plaque for the Form of 2012. 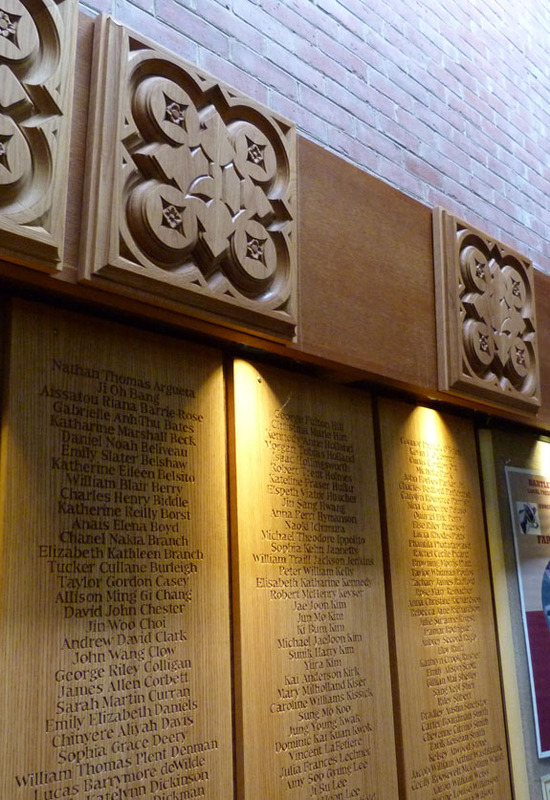 It was dedicated on June 1, 2013 and hangs in the Middle Dining Hall of Coit (The Upper) above the panels that contain the names of all the members of the Form of 2012. Below the photo is the description of the elements incorporated in the plaque design. 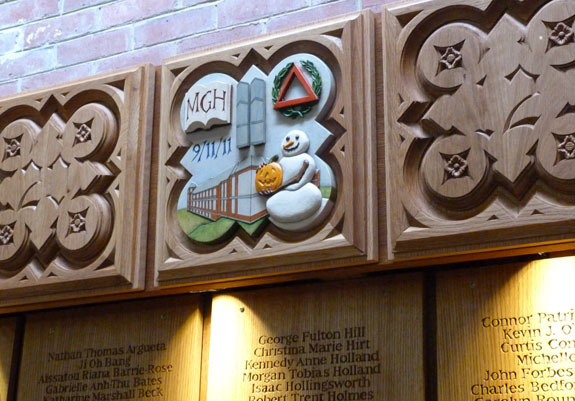 The upper left corner of the plaque features an open book with the initials MGH carved onto the pages, representing the beginning of the Rectorship of Michael Gifford Hirschfeld, Thirteenth Rector of St. Paul’s School. The book symbolizes the Rural Record, a journal of day-to-day life that was kept at St. Paul’s School from 1857 into the early 20th century. 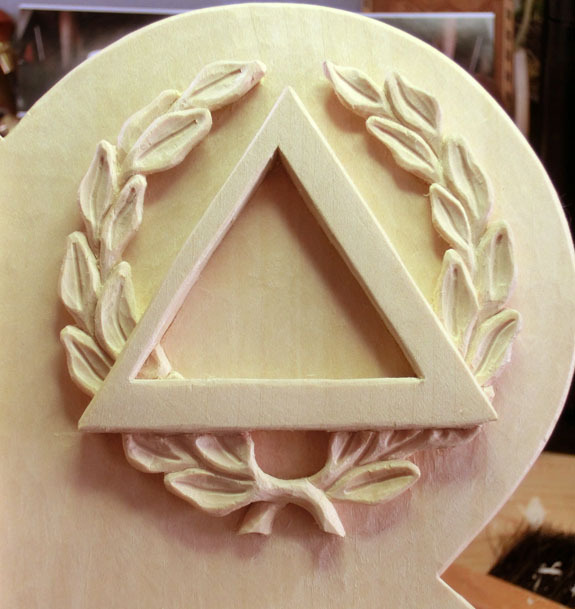 The upper right corner shows the symbol for the Delphians – the Greek letter Delta surrounded by a laurel wreath – winners of the Club Cup competition for the School year. 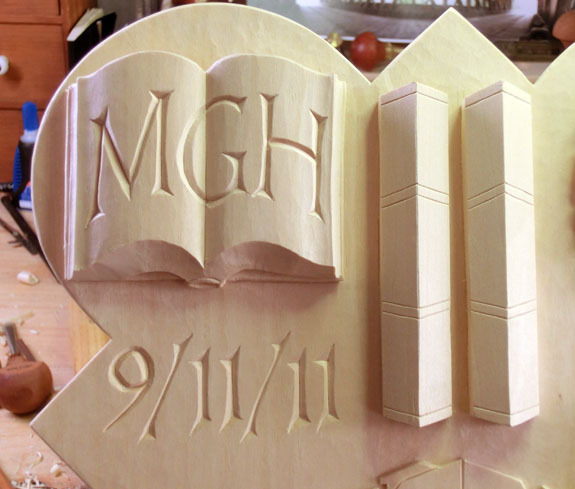 The upper center of the plaque has the World Trade Center towers and in the middle left section the date 9/11/11is carved – marking the tenth anniversary of the September 11th terrorist attack. 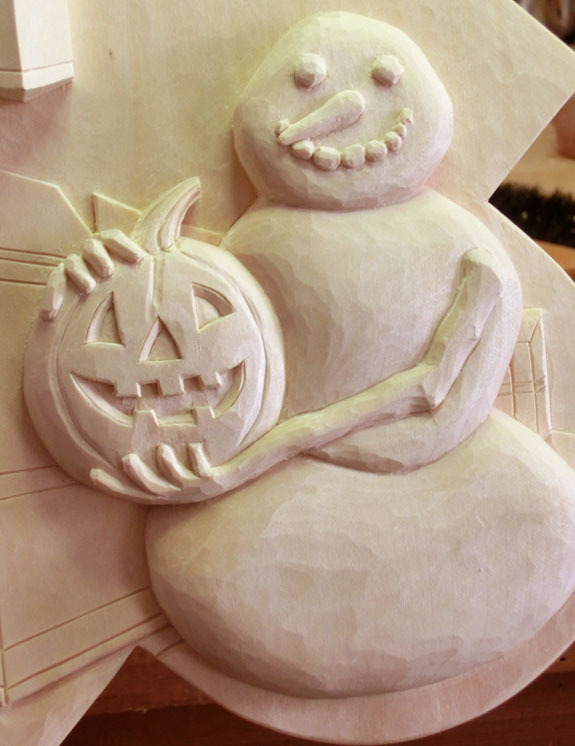 A snowman holding a Jack-o-lantern is carved in the lower right corner of the plaque, representing the big snowstorm on Halloween – the only significant snowstorm of the winter season. 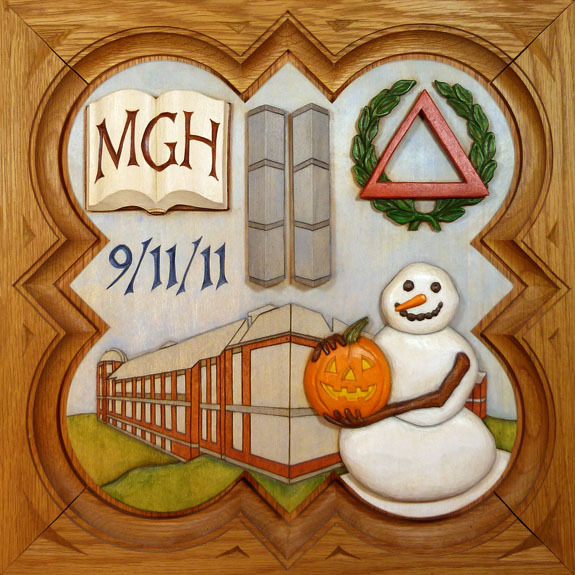 To the left of the snowman is the newly constructed Lindsay Center for Mathematics and Science, dedicated on November 29, 2011. 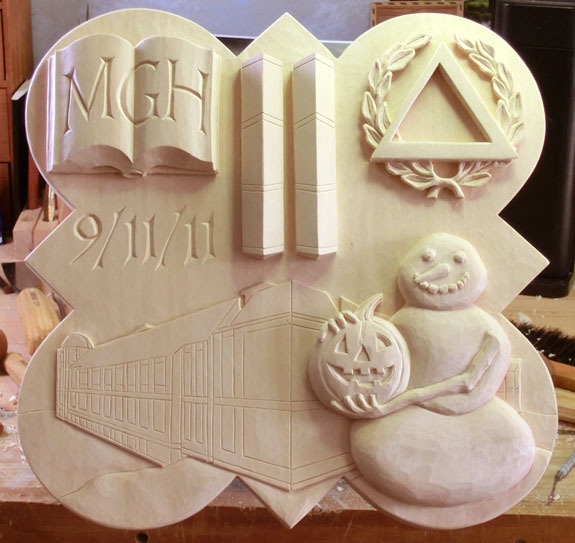 The carving process for the 2012 Form plaque is complete. 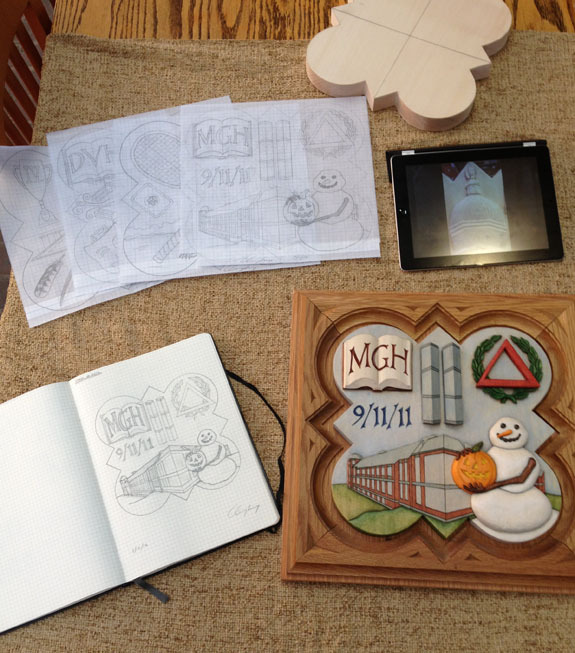 Below are some photographs of the carving process, with details of the finished carving as well. 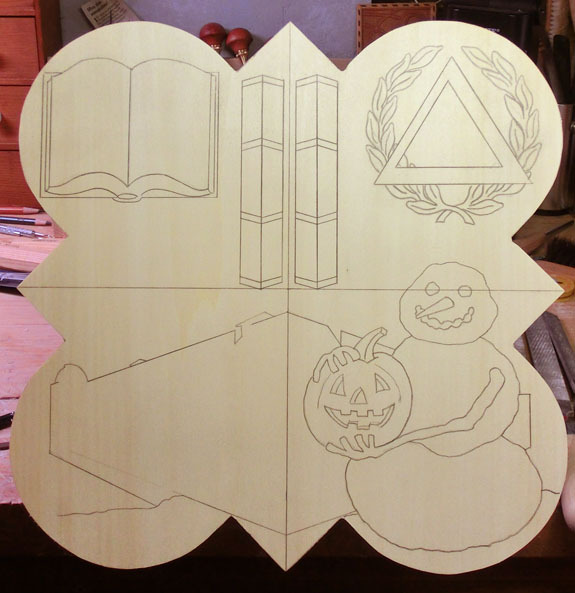 This first photograph shows the design layout on the plaque blank, with outlines in place as guides for roughing out the background. This shows the plaque after being roughed out with a small format router. 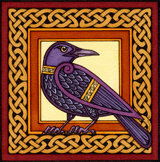 This sets an even depth for the background of the plaque. From this point forward all the carving is done using hand tools. 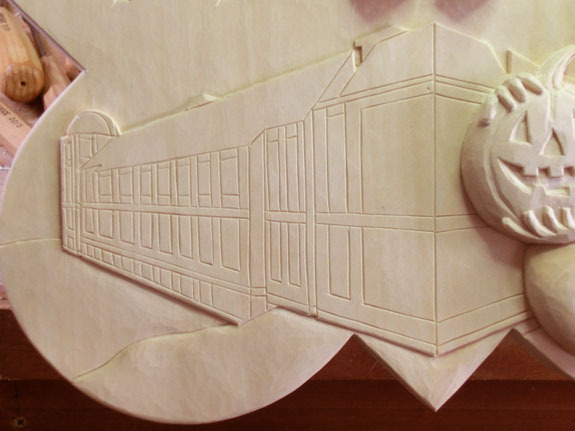 A big jump to the finished carving – after many, many hours of work the fine details are all in place. 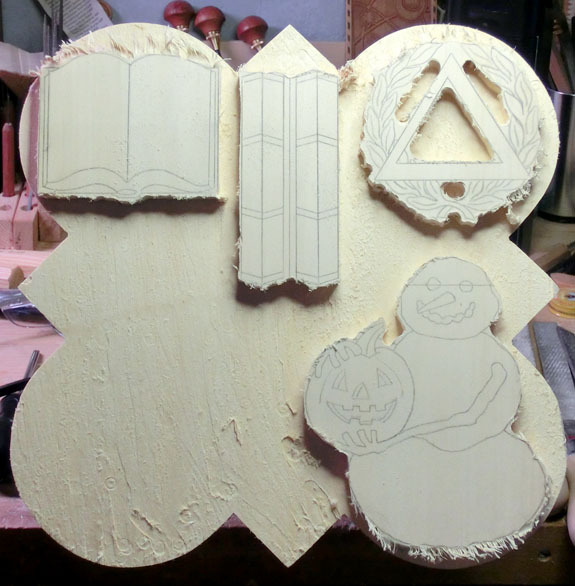 I first carve the rough shapes for the entire design and then refine each element to its finished state. This detail shows the book with Mr. Hirschfeld’s initials – marking the beginning of his Rectorship. The World Trade Center towers are on the right of the photograph with the 10th anniversary date of the 9/11 terrorist attack. This detail shows the Delphian symbol – winners of the Club Cup for the 2011/2012 School year. The Lindsay Center for Mathematics and Science is shown in this detail. The snowman and Jack-O-lantern representing the Halloween storm that blanketed Millville in deep snow. 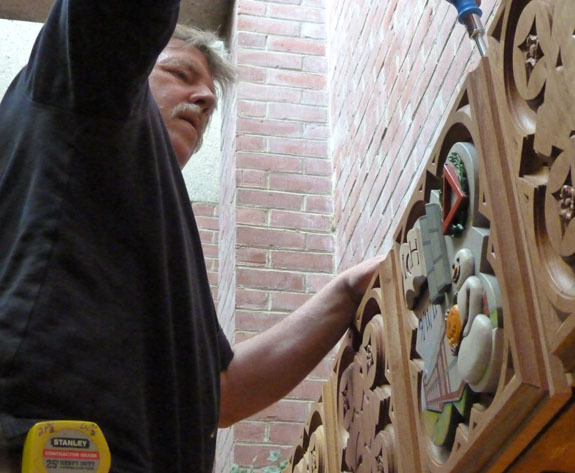 The next stage in the process involves sealing the plaque with oil and then painting it and adding the protective finish. The next time you will be able to see the plaque will be Anniversary weekend at the beginning of June of 2013. I’m looking forward to finishing the plaque and sharing it with all the members of the Form of 2012! Upper left: An open book with the initials MGH. The book symbol represents the Rural Record, a diary of day-to-day School life that was kept from 1857 into the early twentieth century. Michael Hirschfeld’s initials are incorporated on the pages of the open book, symbolizing the beginning of his Rectorship and representing the recording of the event of the change in leadership into School history. Upper right: The symbol for the Delphians – the Greek letter Delta surrounded by a laurel wreath – winners of the Club Cup competition. Upper center and middle left: The World Trade Center towers and the date 9/11/11 – marking the tenth anniversary of the September 11th terrorist attack. 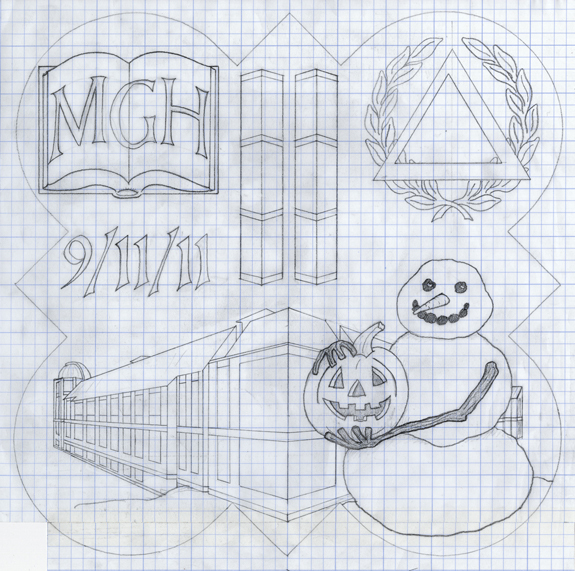 Lower right: A snowman holding a Jack-o-lantern representing the big snowstorm on Halloween – the only significant snowstorm of the winter season. Lower left and center: The Lindsay Center for Mathematics and Science, dedicated on November 29, 2011.